Sorry... the 2017 Ford C-Max Energi is no longer being sold as new. 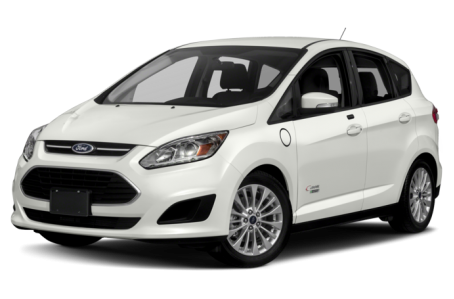 The Ford C-Max Energi is the plug-in version of the C-Max Hybrid hatchback. This year, it remains largely unchanged. However, the trim levels have been revised. Two trims are now available: the SE and Titanium. From the exterior, the C-Max Energi is virtually identical to the C-Max Hybrid. The front-end has angry headlights and a dual stacked grille as well as a segmented lower fascia. The rear-end features a steep liftgate like those found on minivans. Standard features include automatic headlights, side mirrors with turn-signal indicators, and 17-inch alloy wheels. Power/heated side mirrors, a panoramic moonroof, a hands-free liftgate, and rain-sensing windshield wipers are available as well. Under the hood, the C-Max Energi is powered by a 188-hp, 2.0-liter 4-cylinder engine with an electric motor mated to an electronically controlled continuously variable automatic transmission. The C-Max Energi has a 19-mile EV range by utilizing a 7.6 kWh Lithium-ion battery. The EPA estimates it has a total 550-mile driving range. Inside, the C-Max Energi has a two-tone cloth interior and a 60/40-split folding rear seat. Cargo space is 42.8 cubic feet with the rear seat folded down. The center stack features the standard SYNC audio system that include CD/MP3 playback, Bluetooth connectivity, and a USB port. It can be upgraded to the SYNC3 multimedia system with an 8-inch touchscreen, an integrated navigation system, voice command recognition, two USB ports, and a Sony premium audio system. Standard features include dual-zone automatic climate control, cruise control, power windows/locks, remote keyless entry, and a leather-wrapped steering wheel. Leather upholstery, heated front seats, and ambient lighting are also available. Standard safety features include an advanced airbag system, antilock brakes, an electronic stability control system, a backup camera, and a post-collision notification.